Fabia Drake was born in 1904 in Herne Bay, Kent. She acted with the MemoriaL theatre of Stradford and travelled with them on tour to the U.S.A. She was well into middle age before she became a familiar character actor on film. Her movies include “White Corridors”, “The Good Companions” and “A Nice Girl Like Me”. She made “The Year of the Dragon” with Mickey Rourke in the U.S. In her eighties she won critical acclaim for her roles in “Valmouth” and “A Roome With A View” and on television in the epic “The Jewel in the Crown”. 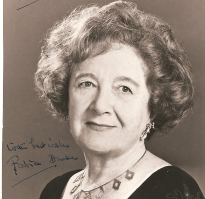 Fabia Drake died in 1990 at the age of 86. Born not Drake, but Ethel McGlinchy, the actress’s Irish father, a caterer, was an actor manqué, whose great love was the theatre and who was given to quoting Shakespeare. She passed an entrance test to the Academy of Dramatic Art (later to become RADA), in December 1913 – a small class existed at that time for children between the ages of ten and sixteen who attended only in the afternoons but who had an identical adult curriculum with that of senior students. (It was the high-ups at the ADA who decided McGlinchy was too difficult to pronounce and too hard to remember for a stage name so she changed it, ultimately by deed-poll, to Drake which was the second of her father’s Christian names and to Fabia which was the second of her baptismal names, chosen because she was born on St Fabian’s Day). Founded by Sir Herbert Beerbohm Tree, her contemporaries at the Academy of Dramatic Art included the actress Meggie Albanesi, Eva Le Gallienne, and Miles Malleson – a senior student who wrote plays for her. She was small, was called the Shrimp, and played a very wide range of parts – Richard II, Macbeth, Cardinal Richelieu in Bulwer Lytton‘s play, the Shaughraun in Dion Boucicault‘s The Shaughraun. Her teachers included Norman Page, whom she admired and whose teaching she responded to – “he gave you confidence, he inspired you with his enthusiasm’, and Helen Haye, whom she did not respond to and who was not, according to Drake, a great teacher. She made her first professional appearance on a stage at the Court Theatre, Sloane Square, in a Children’s Theatre production called The Cockjolly Bird, as a hermit land-crab – “in a shell of immense weight and unparalleled discomfort.” Her first paid work came when she was cast in a production of The Happy Family. Also in the cast was a young man who “had rather ‘stick-out’ ears, and his name was Noël Coward.” It was the beginning of a lifelong friendship. In the same year, 1916, she met a heroine, Ellen Terry, when she played Robin, Falstaff’s diminutive page in scenes from The Merry Wives of Windsor, for a week, at the Palace Pier Theatre in Brighton. Besides acting the most formative influence in Drake’s childhood was the Anglican religion – later seceded from – and the outstanding memory of her Christmases was the sung Saint Cecilia Mass of Gounod, at the Midnight Mass in the Anglo-Catholic church of All Saints, Margaret Street. One of the preachers at this church, Geoffrey Heald, produced each year the All Saints choirboys in scenes by Shakespeare, in the clergy house. When one year the chorister set to play Sir Toby Belch in the kitchen scene from Twelfth Nightfell ill, Drake was called in to replace him, and so she met a junior chorister also in the production – Laurence Olivier. “His subsequent intimate friendship became one of my most treasured possessions; we would watch each others work, stay in each others houses, be available during public and private moments of triumph and disaster” she wrote, though she never played with him again. At the age of sixteen she was sent to a finishing school in France, Camposenea at Meudon-val-Fleury. It had been a hunting lodge of Louis XIV and the sunken marble bath of Madame de Maintenon was still in place. She was taken to Reims, in ruins after the First World War, to Versailles, Chartres, the Forest of Fontainebleau, and she was taught, amongst others, by Georges Le Roy sociétaire of the Comédie-Française who was to become one of the great teachers of the Paris Conservatoire. Drake worked with Tallulah Bankhead on Roland Pertwee‘s The Creaking Chair. Bankhead was 23, Drake 20. Bankhead found Drake’s virginity an absurdity: “Such a shocking waste, Dahrling, with your figure.” They became genuine, if unlikely, friends; Tallulah was a wit, with warmth and generosity. Back in London in 1921 and unemployed she spent time with Meggie Albanesi, in her dressing room during her ‘waits’ in Albanesi’s current success A Bill of Divorcement at St Martin’s Theatre. Drake wrote that, “Albanesi was by now established as the most talented young actress in England, under contract to Basil Dean…the warmth and sympathy of her personality was like a lodestar in my bleak night sky.” Having tried, and failed, to gain employment with J.E.Vedrenne, Drake decided to join Madame Alice Gachet’s French acting classes at RADA, another teacher of brilliance, her most famous pupil – Charles Laughton. She did then sign with Vedrenne for 18 months, playing small parts, and understudying and was then sent to Basil Dean who was about to produce James Elroy Flecker‘s Hassan. This proved a memorable production, incidental music was by Frederick Delius, the great ballet in the House-of-the-Moving-Walls was devised byFokine, and the cast included Malcolm Keen as the Caliph and Henry Ainley as Hassan. Drake, an understudy, would play both of the two women’s parts in the play, Yasmin and Pervaneh – Isabel Jeans (Yasmin) and Laura Cowrie (Parveneh), both went down with influenza in the epidemic of 1923. In the London theatre between the First and Second World Wars, Sunday play-producing societies flourished. These societies acted as shop windows for rising players and try-out theatres for new dramatists. RADA ex-students decided to have their own Sunday society, The RADA Players and Drake became the second of its secretaries. In a play of Allan Monkhouse‘s called Sons and Fathers, Drake played opposite John Gielgud. She was the victim of serious stage-fright at this period in her career, the result of a spasm in her throat that prevented her from speaking and that she feared would return at inopportune moments. In 1929 she went with the Memorial Theatre, Stratford-on-Avon on its tour of the United States – in three weeks she had to learn the parts of Lady Macbeth, Beatrice in Much Ado About Nothing, the Queen in Hamlet ( ‘but I should never have been cast to play Gertrude. I was only twenty-five, just a touch on the young side when the Hamlet is nearing forty’), Mistress Page in The Merry Wives of Windsor, Hippolyta in A Midsummer Night’s Dream, and Viola in Twelfth Night. Later Drake reflected that Bridges Adams, the resident Director of the Memorial Theatre, (Royal Shakespeare) did her a disservice in this, for the restrictions of the time-table required she learn her roles by rote. There was no time for her to live with the parts. (As Lady Macbeth in 1933 at Stratford, the Komisarjevsky production, in the sleepwalking scene, she was painted by Walter Sickert – the work was exhibited at the Royal Academy exhibition in 1934 to celebrate Sickert’s election as R.A.) Shortly before leaving on the White star liner SS Megantic rehearsing Macbeth she suffered a recurrence of the spasm in her throat and so the trip began with an element of fear. Drake was offered a contract for a six-month tour of the U.S. and Canada – a very demanding one, nine plays, eight of them to be presented one after the other in the first week. She had to learn her parts in three weeks. ” Mistress Page proved a great stumbling block. She speaks only prose…only two days were left for Mrs Page: ‘Oh I can finish her off (she nearly finished me off) on board the boat “, (the SS Megantic, above) – Drake wrote that the ‘cramming’ required to play all the parts harmed her ability to play some of these later in her career. Afraid of a choking fit and being unable to speak her lines she nevertheless got through her performances in Boston, Pittsburgh, Cleveland, St Louis, Denver, Washington – but in Chicago she finally reached the end of her strength. She sought psychiatric help and with the psychiatrist traced the first intrusion of her phobia into her work on the stage and its possible origin in a lie she had told to avoid catechism when she had made herself sick by pushing a spoon down her throat. Until her temporary retirement from the stage, when she got married, she was henceforth to make herself physically sick before each and every performance to get rid of the choking before she went near the stage. Back in England her friend John Gielgud asked her to play Rosalind in a production of As You Like It at the Old Vic – Drake would become closely identified with this role. In 1931 she made another tour of the U.S. and Canada, this time meeting Ivor Novello in Los Angeles – he too became a friend. Back from Hollywood she played in the opening performance at the Stratford-on-Avon Memorial Theatre, Henry IV, Part I, which was a near disaster because much of the performance was inaudible. Drake herself, playing the minute part of Lady Percy, was helped by the fact that she played her first scene on the apron-stage, and was completely audible. The critics noticed her performance all the more; H.V. Morton was covering the event for the Daily Herald and the next morning the Daily Herald produced a placard on its billboards which read : All Stratford talks of one woman. Following her marriage in December 1938 to Maxwell Turner, a barrister-at-law, she retired entirely from the stage. Her daughter was born in March 1940. Over ten years of provoking physical sickness before each and every performance had taken its toll, but in 1943, when Sir Kenneth Barnes asked her to join his depleted teaching staff at RADA she was recovered and available. For the three years 1943, 1944, 1945 she worked with students, work which she later described as, ‘one of the most stimulating and rewarding periods’ of her life. Her students included Roger Moore, John Neville, Robert Shaw, and Richard Johnson. She also undertook a production ofHenry V, although it was not with RADA students, but with American Army personnel. Renée Asherson also appeared in the production, the French Princess of the film version. (Having seen this production Robert Donat asked Drake to undertake the casting and production of his forthcoming post-war season in management at the Aldwych Theatre). Drake’s teaching work finished at RADA when she began to have a pain in her jaw and she had to leave in the middle of a term. She became interested in researching Shakespeare’s troupe of actors, men like Richard Burbage and Thomas Pope, and the effect the actors had on Shakespeare’s creation of roles for them. Her husband having died from liver cancer at the age of 53, she was invited by Binkie Beaumont to return to the theatre. She accepted the offer of a part in a thriller called Write Me A Murder by Frederick Knott. Feeling the need for sun and a warmer climate after the play finished she travelled to Ischia – it was 1962 and the year of the Great Freeze in Britain. From this point travel became an important part of her life, and through this she came to know ‘learned gentlemen’ who spoke to the travellers on cruises on cultural matters., men like Maurice Bowra, John Wolfenden, and Mortimer Wheeler. She wrote later of owing a great deal to Wheeler : ” Because, when a woman loses her man in death and is no longer young she can easily move into a resigned approach to old age which Aphrodite Ambologera is said to postpone”. She trusted and valued his friendship, amitié amoureuse. She continued to work on radio and on television, including work with Dickie Henderson in comedy sketches for Thames TV, and Leslie Crowther (in ATV‘s Big Boy, Now! ), as well as in major series like The Pallisers and P.G.Wodehouse‘s, The World of Wooster, playing Bertie Wooster‘s outrageous Aunt Agatha, with Ian Carmichael (Bertie) and Dennis Price (the inimitable Jeeves), and an acclaimed performance as the eccentric, reclusive, Anglo-Indian matriarch Mabel Layton in The Jewel in the Crown (1984). There were also two notable screen performances in her last years, as Catherine Alan in A Room with a View (1985) and as Madame de Rosemonde in Valmont (1989), in whichThe New York Times praised her performance for its “quiet dignity.” She was awarded the OBE in 1987. She married Maxwell Turner, a barrister-at-law and brother of John Hastings Turner the dramatist of her two plays with Marie Tempest, in December 1938. Their only child, a daughter Deirdre, was born in March 1940. The above “Wikipedia” entry can also be accessed online here.